I love faux frying foods using panko. This crunchy, spicy chicken would be great on a taco salad. Super easy and fast caserole that is no boil no bake and sastisfies hunger quickly! A great way to use leftover cooked chicken breast. A perfect and spicy way to use up leftover chicken breasts. 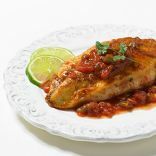 A great, low fat mexican meal with lots of spice! I love enchiladas! These are full of vegetables in addition to the cheese and creamy sauce. Each one has a full serving of veggies, plus almost 20% of your daily fiber. These tostadas are healthy, easy to make and kid-friendly. Feel free to top them with extra veggies of your choice! Perfectly seasoned ground turkey, loads of crunchy vegetables, and a velvety tomato sauce spice up an Italian classic. Queso fresco takes it over the top.